Kick it is the ultimate universal cell phone kickstand because it works with all model phones such as Samsung Galaxy, I Phone, Nokia and Samsung Note. Also works with all the popular cases such as Otter Box, Life Proof, Ballistic and more. The secret is the micro-suction grip pad that allows Kick it to attach to anymodel smart phone or case. More than just a Kickstand for phones, Kick it can be used to mount, dock and hang your phone with ease. Perfect for the home, car, office and on the go. So many cool things you can do with your Kick it phone and tablet kickstand. 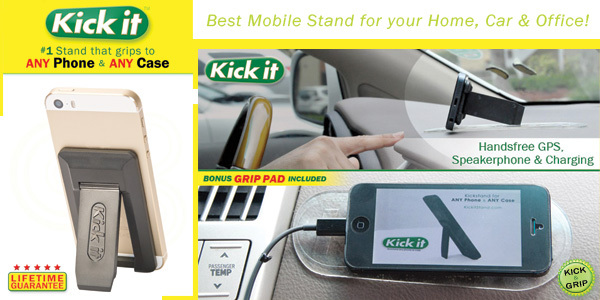 Kick its Patented design allows you to use your smart phone hands free in your car for GPS, Charging and Speaker Phone. 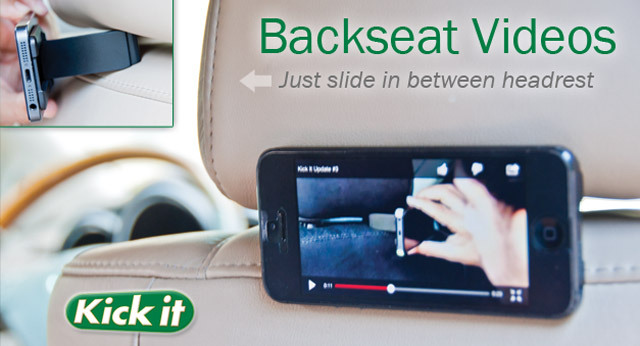 Wedge it in the headrest for backseat videos to keep the kids occupied on that long car ride. Our super strong micro suction grip pad allows you to mount your phone to any surface. The possibilities are endless. Hands Free video chat, selfies and photography tool in one. You will wonder what you did before you had a Kick it. With ventricle and horizontal display giving you 8 Angles total to choose from, no other phone stand on the market can even compare. What makes Kick it cell phone stand so great is that it is made for every day practical use. This is not some gadget you buy and use once that toss in the closet. This literally might be one of the best $20 you will ever spend. Take the time to Check out the Kick it video on Kickitstand.com and read testimonials on Amazon Reviews.